What makes or breaks a salad for me is the dressing. It sets the overall tone of every bite. Toppings are important, too, but you may only get a couple bites of each throughout the course of enjoying your salad. The dressing coats every single bite, giving the lettuce its much needed flavor boost. 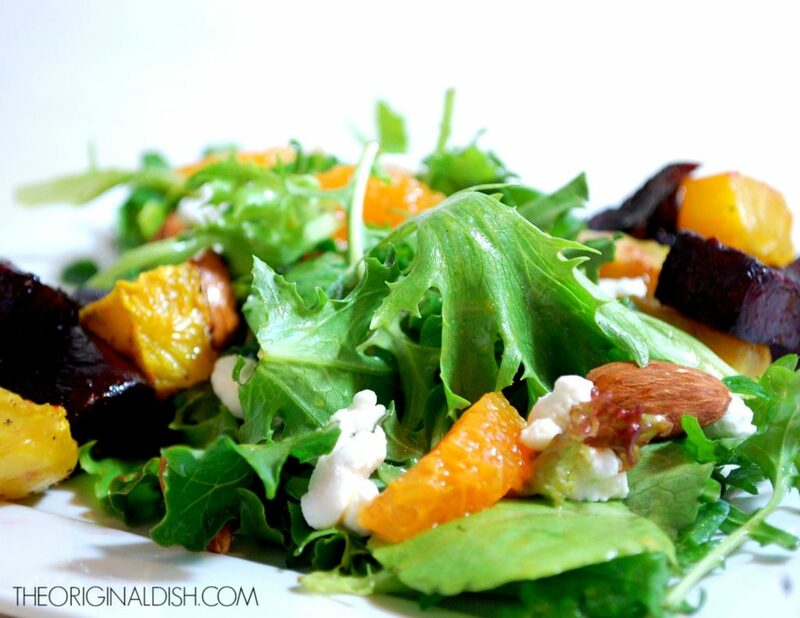 That’s why when coming up with this salad recipe, I gave extra attention to the dressing, a black garlic & orange vinaigrette. The black garlic and orange make a really interesting combination. It’s a little tangy from the orange juice and zest, while the tender black garlic gives a deep, earthy flavor that lingers on your tongue. 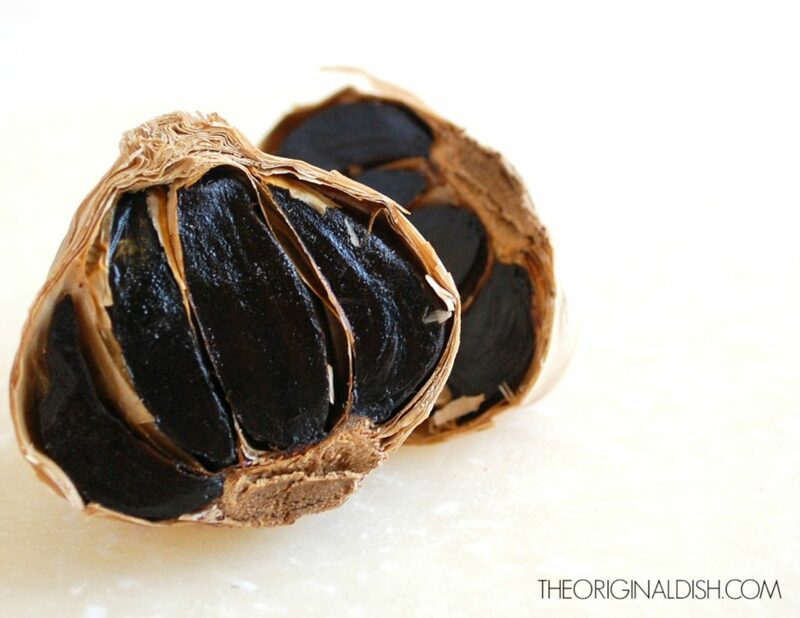 If you’ve never used black garlic, it’s a form of garlic that involves heating whole bulbs over a long period of time, basically caramelizing the garlic and turning it black. Its complex flavor adds a lot to this vinaigrette. 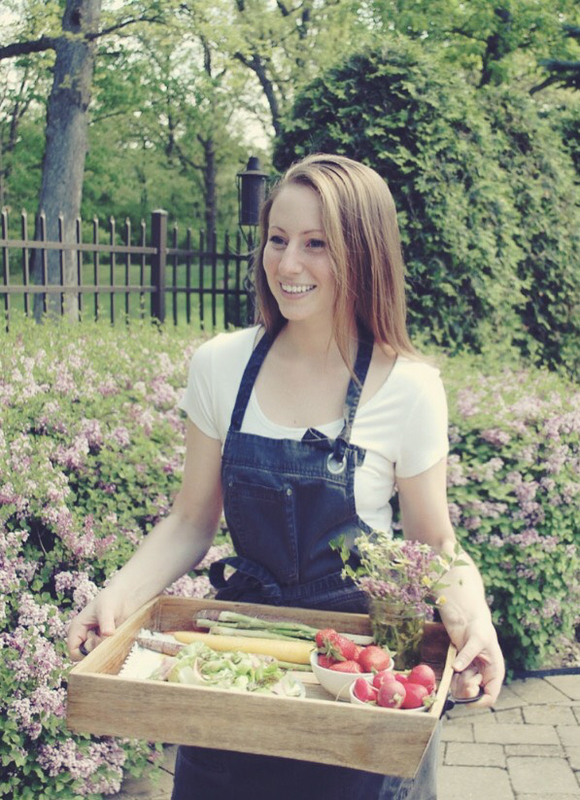 A few other simple ingredients are all you need to make a great salad. Some toasted almonds add crunch and a nutty flavor. 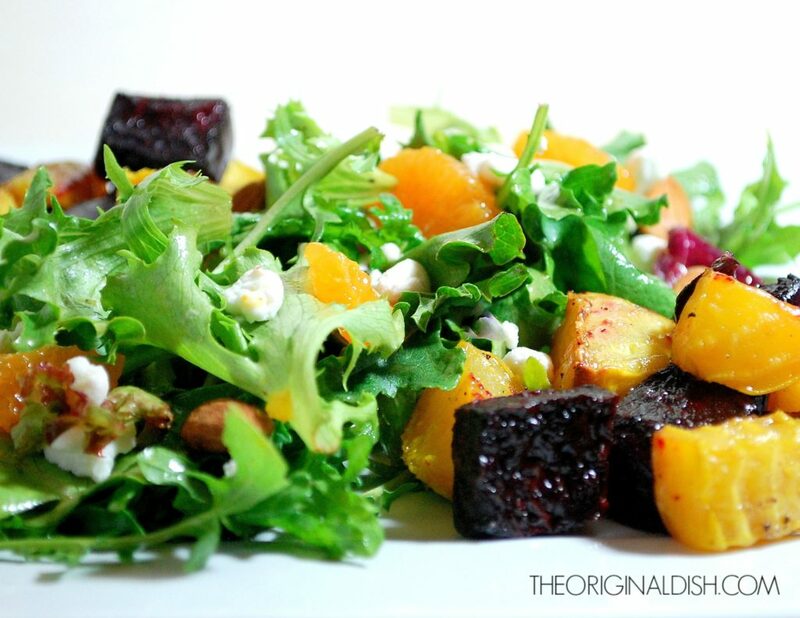 Crumbles of goat cheese compliment the citrus with a tangy taste and creamy texture. The finishing touch: refreshing bites of fresh orange segments. It’s a simple salad to put together, but the flavors will leave you craving more. Preheat the oven to 400°F. 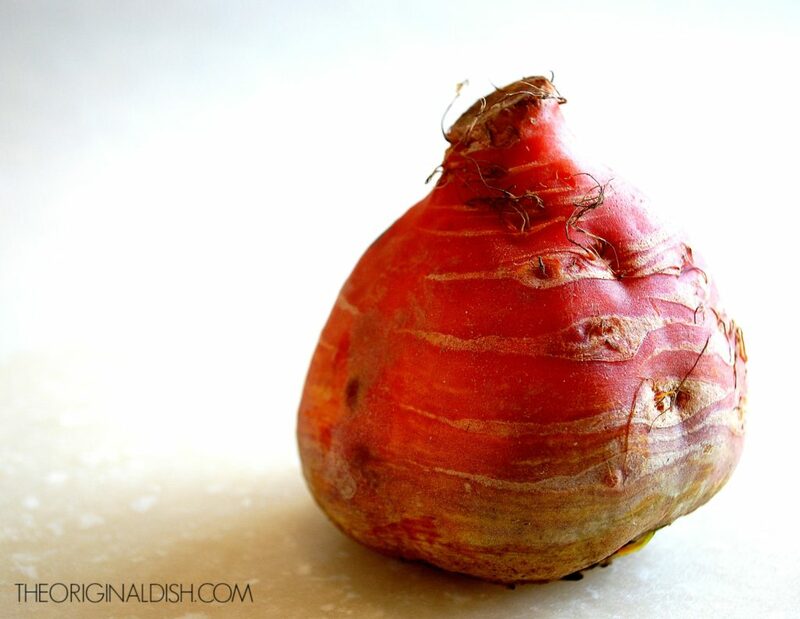 Cut the tops and roots off of each beet, peel them, and cut them into medium-sized chunks. Spread them onto a sheet pan, keeping the red and golden separate. Drizzle with olive oil to coat. Season with a generous amount of salt and pepper. Roast in the oven for 40-45 minutes, until tender, tossing occasionally. Meanwhile, toast the almonds on a sheet pan in the same oven for 5 minutes, until nutty and fragrant. Whisk together the white wine vinegar, orange juice, orange zest, black garlic, honey, salt, and pepper in a medium-sized bowl. Slowly drizzle in the olive oil, whisking until incorporated. Stir in the basil at the end. Toss the lettuce greens with most of the vinaigrette. Spoon the beets onto the lettuce, drizzling more of the vinaigrette on top of them. 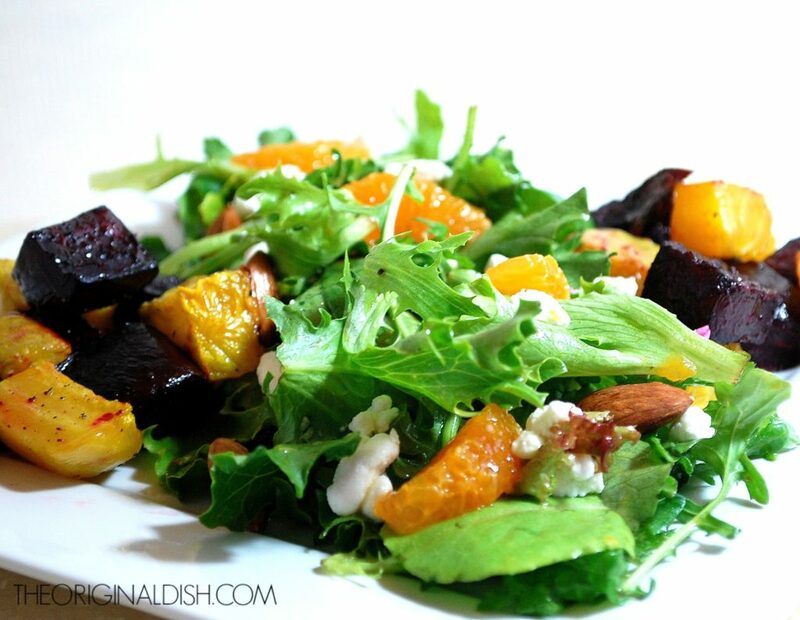 Scatter the almonds, orange segments, and goat cheese around the salad. You may not need to use all of the vinaigrette. It depends on how much you like on your salad. If you have extra, keep it in the refrigerator for a couple of days. Use it on other salads, as a marinade for chicken or fish, or toss it with other roasted vegetables (carrots or broccoli would be good). When toasting the almonds, keep a close eye on them. They can burn very easily. Pull them out of the oven as soon as they turn slightly golden and smell nutty. 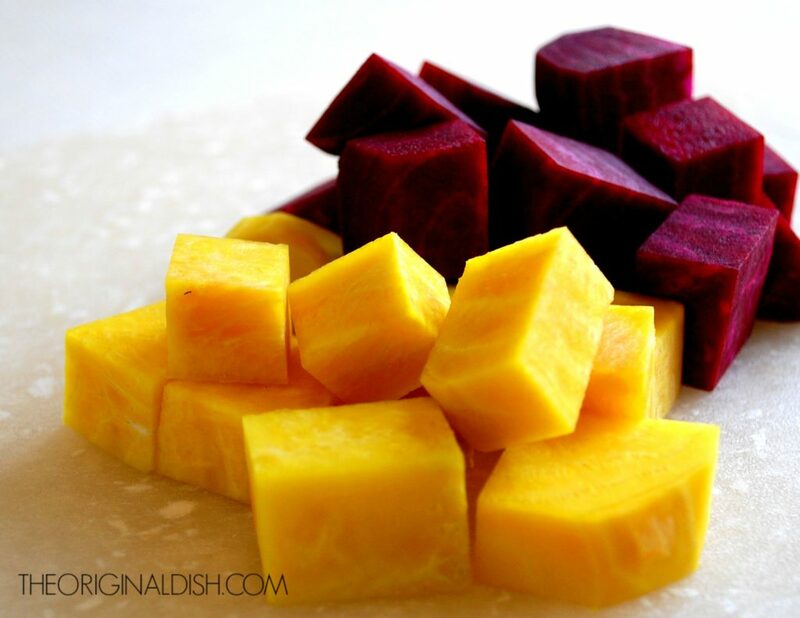 Love beets! And your breakfast bowl looks awesome. Never thought to use them in that way…I will have to give it a try!